Welcome Back to the Spring 2019 Semester! Welcome back to a new semester! 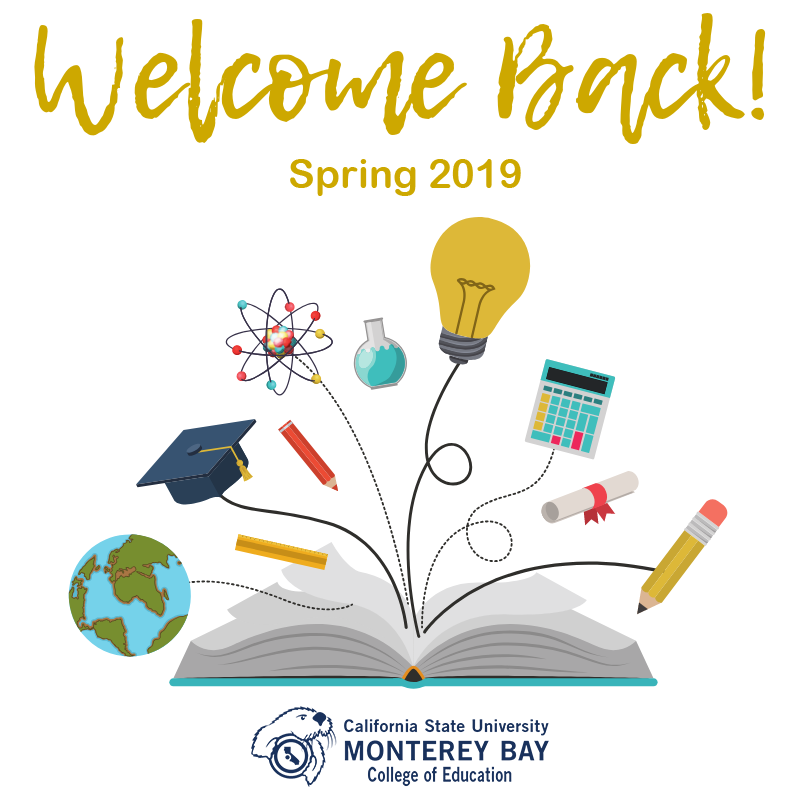 I hope the winter break gave you an opportunity to spend quality time with family and friends and to prepare for the excitement and challenges of the Spring 2019 term here at California State University Monterey Bay. I extend a warm welcome to our new transfer students. Our campus offers support services and engagement opportunities to enhance your experience and prepare you for life beyond CSUMB. As students, you hold great potential to shape the world and the preparation that you receive here at CSUMB will provide you with the tools to succeed in your future endeavors. I also offer my congratulations in advance to all of the current students who will be graduating in May. I look forward to celebrating all of your wonderful accomplishments. We are proud of you! Please know our staff is here to support you in any we can. I am glad you are here. The vision and mission statements below were crafted by members of the College of Education Sub Committee charged with finalizing the Vision and Mission statements. Their work was based on the products that resulted from a series of Sub Committee and College-wide strategic planning meetings as well as conversations with key community stakeholders. Through innovative teaching and scholarship, the College of Education prepares highly effective, culturally sustaining professionals who serve, engage, and transform communities and schools to promote equity and social justice. The College of Education prepares innovative scholar-practitioners who enact culturally responsive and sustaining, evidence-based practices to cultivate lifelong learning and well-being in diverse communities.